The Advisory System tracks esoteric trends in fashion, politics, and the price of pork bellies in order to keep you alerted of imminent threats. There are five levels of alert: two are explicit pop culture references, two are allusions to shows you really ought to see, and one is just a pointing, accusatory finger. Given the whims of fashion, the System will give you the finger approximately one-fifth of the time. 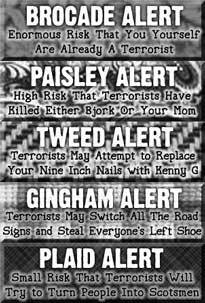 It's hard to say whether this is more or less often than a genuine alert system. Keep in mind that this is only a mock alert system, which lacks even the resemblance to a real alert system that mock turtlenecks have to real turtlenecks. If you decide to take the System too seriously, either to plan your life around it or to admonish people with warnings, then you should expect a responsive salvo of ridicule. Not small-fry ridicule, either. Half-ton, bunker-busting ridicule. If you want to track the alert system on your website, use the code below. Please don't link directly to any of the image files.